This clear and concise book provides practical, evidence-based guidance on the use of mindfulness in treatment: its mechanism of action, the disorders for which there is empirical evidence of efficacy, mindfulness practices and techniques, and how to integrate them into clinical practice. Leading experts describe the concepts and roots of mindfulness, and examine the science that has led to this extraordinarily rich and ancient practice becoming a foundation to many contemporary, evidenced-based approaches in psychotherapy. The efficacy of mindfulness-based interventions in conditions as diverse as borderline personality disorder, post-traumatic stress disorder, depression, alcohol and substance use, emotional dysregulation, attention-deficit hyperactivity disorder, chronic stress, eating disorders, and other medical conditions including type 2 diabetes and rheumatoid arthritis is also described. The book is invaluable reading for all those curious about the current science around mindfulness and about how and when to incorporate it effectively into clinical practice. Alexandra Varga, Metapsychology Online, 22 (2), January 2018. "This slim manual is packed with information. As the title would suggest, Mindfulness centers around the most up-to-date research in this field and its application to the practice of psychotherapy. As both a clinical psychologist and a yoga instructor, the information in this book resonated with me. Although this manual is research-based, it is written in clear, easy-to-understand language. [...] I believe this volume to be an excellent overview of mindfulness in psychotherapy. I would recommend it to any mental health practitioner with an interest in this area." "With the proliferation of modalities integrating components of meditation and mindfulness practice, this book is a welcome addition to Hogrefe’s Advances in Psychotherapy: Evidence Based Practice Series: It is compact, easy to use, organized, succinct, detailed, and informative without being overdone. The book reads well despite the overall density and depth of detail. One walks away with a clear understanding of mindfulness as it stands apart from the Buddhist practice and belief (East meets West) and how specific Western therapeutic interventions have incorporated it into their program." 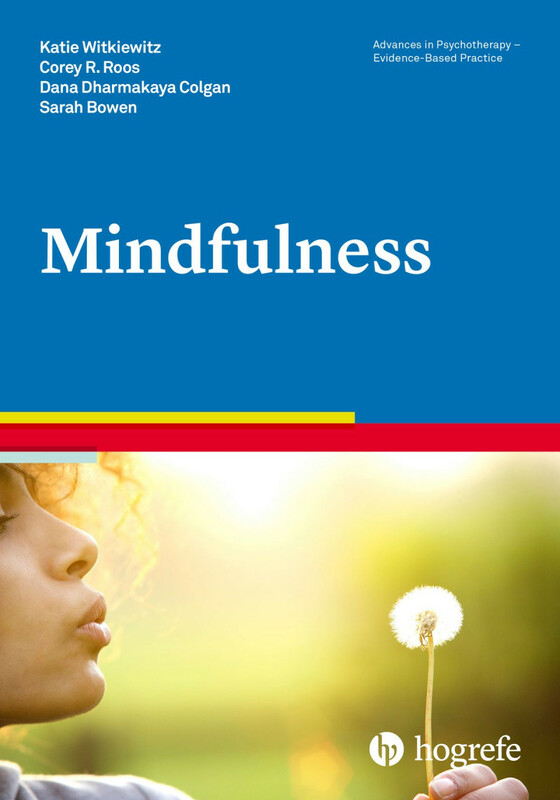 "This small book provides great information and insights that should be helpful to both beginning therapists and those therapists who are interested in knowing about mindfulness prior to deciding to incorporate it into their work. Readers of Mindfulness can find discussions of (a) some roots of, (b) empirical support for, (c) assessment of, and (d) practical suggestion for incorporating mindfulness practices into their practices. We especially liked the authors’ inclusion of the importance of therapists’ attitudes and personal practice." "A very recommendable book to get in touch with mindfulness, explaining different mindfulness theories and models, such as MBSR, MBCT, MBRP, MBCR, MB-EAT, MBTI, treatments and the two basic tools body scan and sitting meditation." "If you’re looking for a brief introduction to mindfulness in contemporary evidence-based practice, this is where to start. The mindfulness literature has become so large that it’s impossible to keep up. This informative book provides a concise overview of Buddhist roots, current theories, and assessment and treatment methods." "Offering conceptual clarity, depth, and analysis, this book skillfully and clearly guides the reader through the practice and implementation of effective mindfulness-based interventions." "The science of mindfulness is evolving so rapidly, and in so many directions, that it has become difficult to get a handle on it. This book does so admirably, providing the most compact, yet most comprehensive introduction to mindfulness research available today. If you want to know what the great flourishing of mindfulness science is all about, this book is for you. It will give you valuable tools to enhance your own life experience, too."